Peter Lombard (born in Lombardy c. 1100, died in Paris c. 1160) was one of the most widely-read medieval theological writers. Having studied in Paris he went on to become a teacher there, writing his famous 'Sentences', Commentary on the Pauline Epistles, and Commentary on the Psalms. 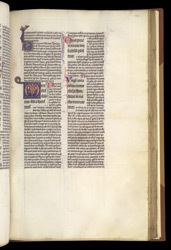 This copy, illustrated with typical iconography at the Psalter divisions, was pawned in 1326 by Brother William de Rokesle to a canon of St. Paul's cathedral, James of Spain, the illegitimate son of King Alfonso X of Castile, and nephew of Eleanor, wife of Edward I. William belonged to the Dominican friary at Ludgate (after which Blackfriars is named), a short walk west of St. Paul's.